Feeling like you are missing out on some of your favorite Fall desserts due to a new diet? Well, not anymore. 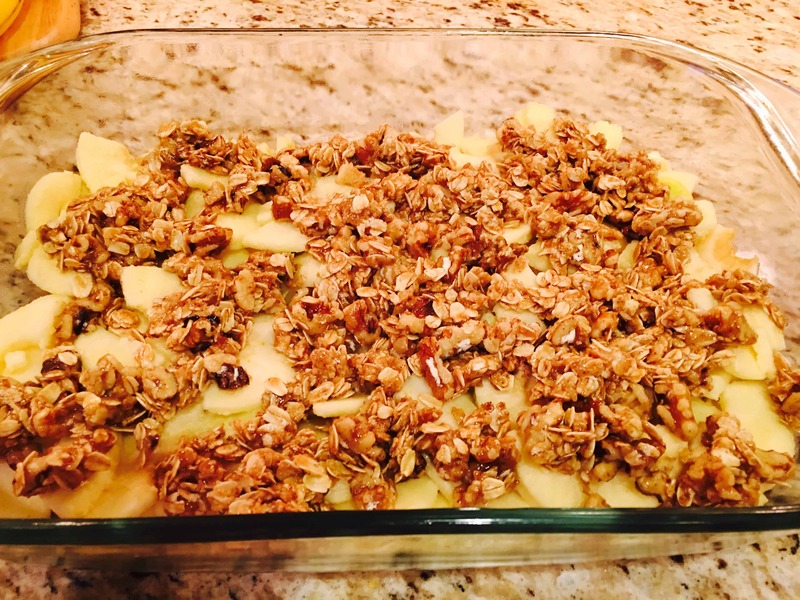 This delicious Healthy Gluten Free Apple Crisp will satisfy your sweet tooth and send you back for more, guilt free. One thing I love about living in NC is visiting the mountains in the Fall. The rich colors of Fall are absolutely breathtaking. Among the changing leaves, another sign of Fall in the mountains is the freshly picked apples. Part of our visit always included bringing back a bushel or two in preparation for some of our favorite Fall comfort foods. Once home, we would make apple butter, apple dumplings and my all time favorite, apple crisp. 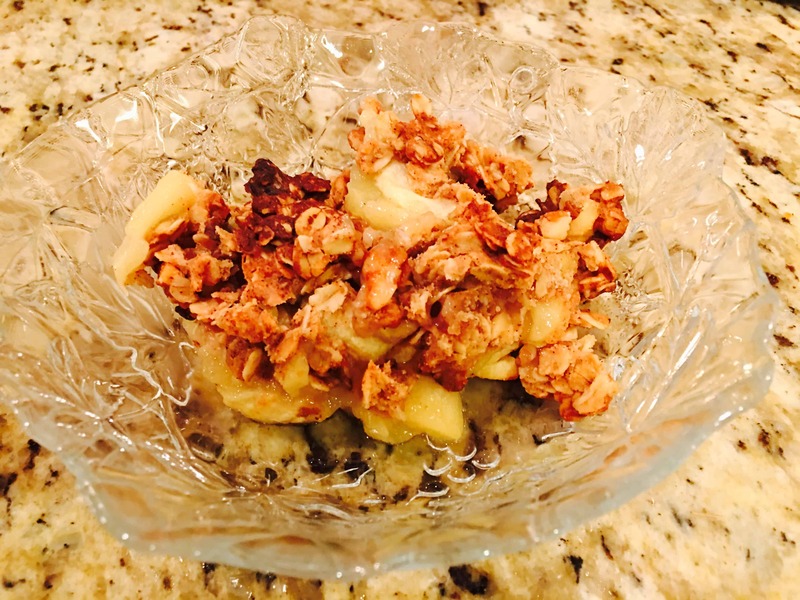 This Healthy Gluten Free Apple Crisp ensures we will keep the Fall tradition even with our commitment to healthy living. 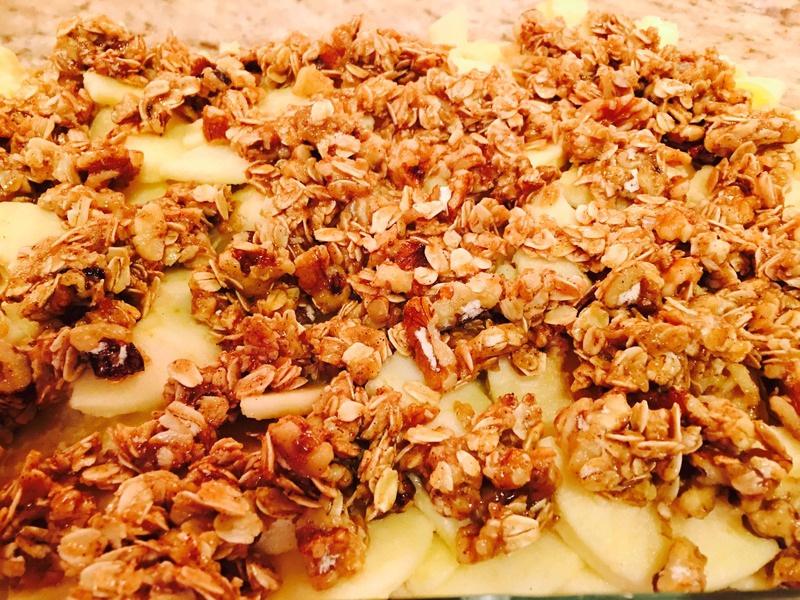 This apple crisp inspired by the Jillian Michaels Apple Crisp recipe found at Of Pots and Pens, has the perfect balance of apples and oats. The walnuts coated with the oat mixture packs so much flavor it is difficult to stop at just one bowl. I could easily eat the entire pan myself. Trust me, you will not miss the brown sugar or butter in this recipe. Healthy does not mean tasteless. This will be your new go-to Fall recipe for company. If you have an apple peeler it will make life so much easier for you – at least for the next few minutes. I love mine and when my kids were younger, I would use it to slice the apples for them to eat in a cool spiral ring. 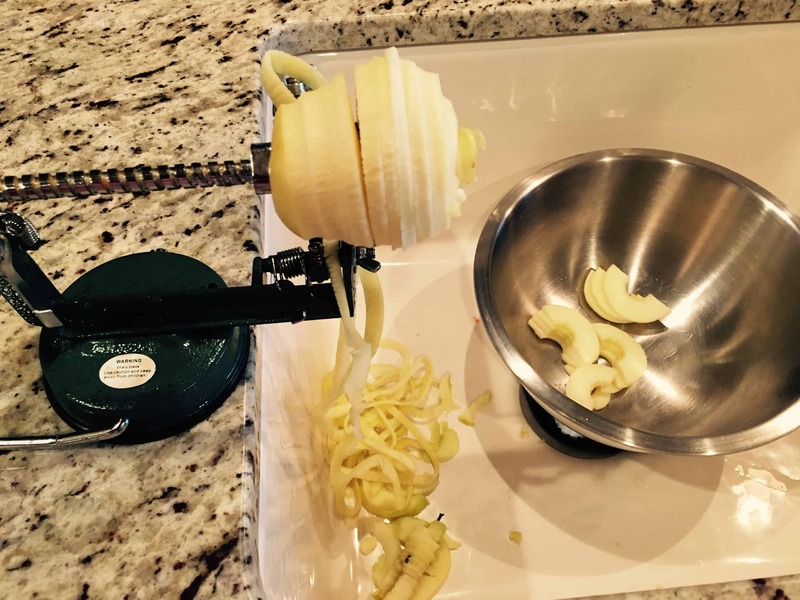 Kids love fun food, and this apple peeler definitely makes an apple more fun. 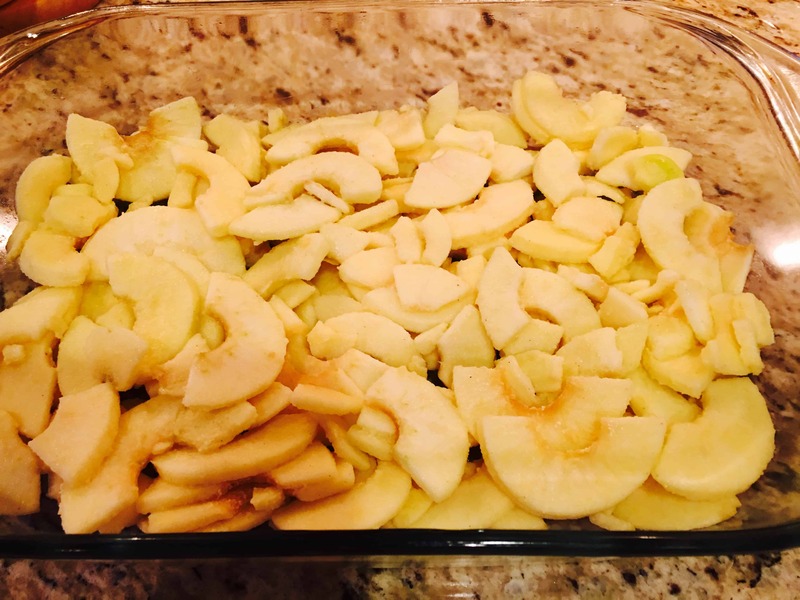 After you have prepared the apples and have spread them evenly in the baking dish, you are ready to mix the rest of the ingredients together in a bowl. 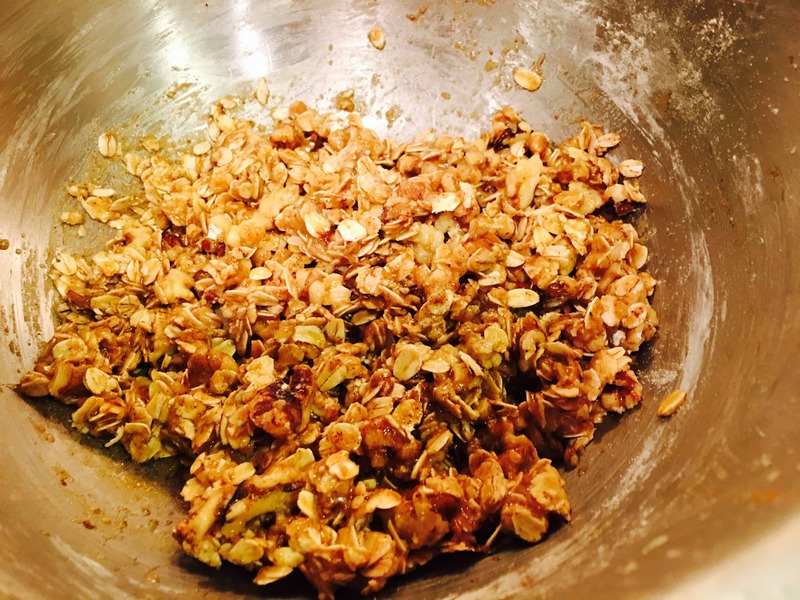 Mix everything together until the oats are all moist and the mixture is clumpy. Spoon the oat mixture over the apples. Bake at 375 for about 40 minutes. Peel and core apples. Toss to coat apples with lemon juice and 1 tab gluten free flour. Spread apples into baking dish. Heat honey and coconut oil in the microwave for 30 seconds until melted. 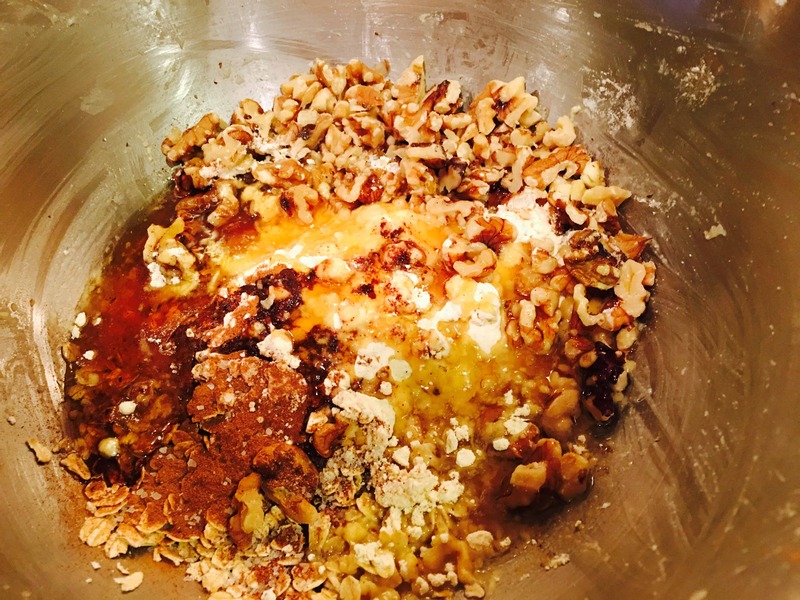 In a large bowl, mix together the flour, oats, walnuts, cinnamon, nutmeg, salt, honey and oil until oats are moist and the mixture is clumpy. Spoon over apples. Bake at 375 for 40 minutes or until golden brown.